Way back in 2007, as I was discovering Michael Fassbender, I saw a cute little movie called, 'A Bear Named Winnie' (2004). 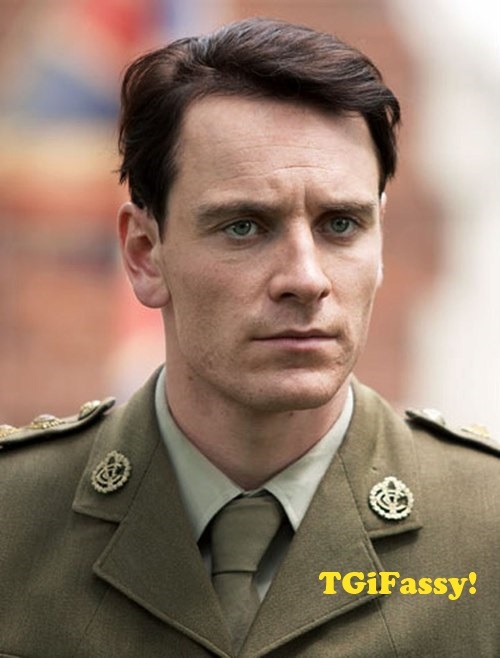 This still is from that movie and I guess I'm in a vintage Fassy mood because the 5th anniversary of Fassinating Fassbender is approaching, and I'm just feeling nostalgic in wanting to honor that on this TGIFassy day. The crazy meltdown that is occurring in another fandom has made me appreciate Michael Fassbender and all his awesomeness because he does things in his own way, and when he wants to. As beautiful as Michael is, he's not perfect and that makes him more human, more real, and more appealing. I will never have the focus, the energy, or the interest to support an actor like Michael at the level of commitment that I have demonstrated thus far for him. Michael Fassbender may not be the most popular or well known actor, but he is well known enough to be in high demand and to still live a normal life. TGiFassy everyone! TGIF! Hey Simone, are we doing something special for 5th anniversary? It's exciting! TGIFF...and with your commitment Simone to this great actor and cool person, there are many years to come! That means a lot of TGIFF'S and films. I follow this blog for a year and a half and it's always interesting/fun to read. Keep up this good work and Fassy on! @Barbara, I want to create something special for FF since our 5th anniversary is on Sept 8, and I'll be in Toronto at the time. I'll figure out something. I just saw A Bear Named Winnie yesterday with some of my family. I would say at this point it is the only movie of Michael's even my 3 yr. old niece can watch. So that was nice. I bought the DVD. It was $15 on amazon and even though they had a cheaper one for like $9 that one only had the Bear on the cover. So I paid more just so Michael would be on the cover.